The honey is strained and filtered, but no fine filtering has occurred, therefore retaining the pollen, propolis and wax traces. The honey has been made by bees that are foraging on blossoms, not bees that are being fed sugar water. How do you know the bees were only going to that tree? Because Honey House Kuranda has built relationships over many years with our supportive local beekeepers, we deal directly with the person who manages the beehives. In this way, we can ensure we know where the hives are, what is flowering in that area and the time of harvest. Of course, we also keep records of our own apiary sites to determine floral source. What is the difference between Single Origin and Multi-floral honeys? If the beehives are (e.g.) in a large stand of Ironbark when it is in flower, the bees will be selecting that floral source as a preference. A large flowering of any nectar producing tree, shrub or ground cover will produce a honey with its own distinctive flavour. We name these honeys as a single origin honey e.g. Ironbark. After many years of honey tasting, it is possible to identify the floral source by the distinctive flavours present. This is a bit more difficult with the complexity of a multi-floral honey. If there were many flowering plants in the apiary area, we name the honeys by the region e.g. Emerald Creek. Of course, we still know the types of trees that were flowering, but sometimes there may be up to 10 different species as potential nectar sources. Are the bees fed sugar water? The honey offered through Honey House Kuranda is from bees that have been foraging naturally. There are times, such as in a drought, when there is no food available naturally for the bees. When this occurs, we sometimes need to feed the bees. However, this feeding is for the colony as emergency supplies and is ceased as soon as blossoms re-appear. Why is the colour and taste so varied? The colour and flavour of different honey is directly related to the original nectar source. 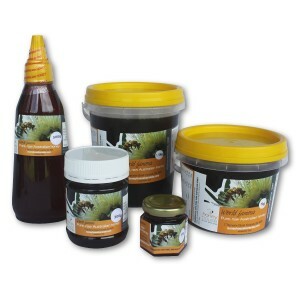 Avocado honey, rainforest honey and many bush (mixed blossom) honeys are black in colour, with a corresponding deep flavour. Ironbark, Grey Box, Molloy Box are lighter in colour, have ‘toffee’ sweetness, but also their own distinctive, more subtle flavours. How many bees did it take to make this jar of honey? It takes approximately 12 bees life work to make a teaspoon of honey. Therefore, approximately 720 bees would be required to produce a 300 gram jar of honey. Why can’t I get my favourite honey all year round? Most plants flower annually at a particular time of year. There is a limited amount of honey that can be produced from that flowering season. Some tropical plants only flower every other year or even less frequently. Our most popular varieties sell out very quickly each year. Customers are encouraged to use the Pre-Order Form with no obligation and to stock up when the variety arrives –no need to worry about it spoiling as Raw honey will never go off.